I love this app! I use it pretty much every single day. Whether it is for transcribing or learning a song. I just wish there was a way to add a click track to a song. 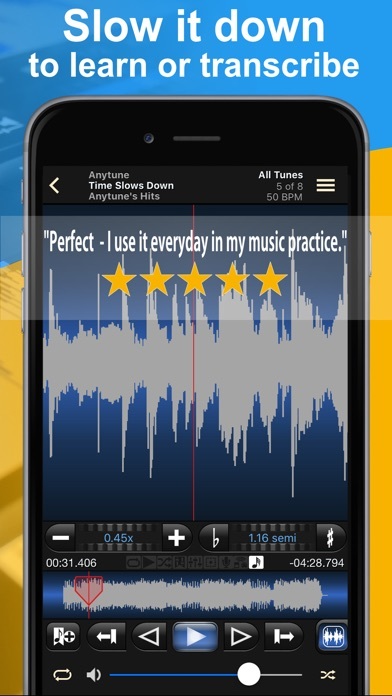 Anytune Pro+ is the best music app out there for practicing and refining my music skills. I highly recommend it! Learning jazz music has never been easier and this app is the main reason. Transcribing Jazz has been changed forever because of this app. I love this app for teaching dance. Its an invaluable tool and anytune has the best support ever. What a great service. Thank you! Music teacher for 20 years and I wish I had this sort of tech a decade ago. I used to drop tunes into Soundforge (Audacity) and slow down, speed up, make loops etc. but it took longer and in a lesson time is ticking so anything to speed up the mundane aspects is worth it. This program is worth the money. Is there a way to bring back the download ability? Because the mercury browser doesn’t help much like it used to. Anyways, this is a great app that I highly recommend. Singers! This one's for you. Singers, there are at least two good uses for this application. One is when you are trying to get the phrasing from a singer who strays from the beat in an appealing way. The other is for accents, at which I'm very good. I am currently trying to master the Carioca accent because I am singing bossa nova. Even just listening 1000 times got me compliments from Brazilians, but this app, because it keeps pitch so well, revealed details instantly that I would never have heard. Bossa nova complicates things because the singers stray from the beat in an appealing way--but it also turns out they might not be. It could be just the accent. Great app. 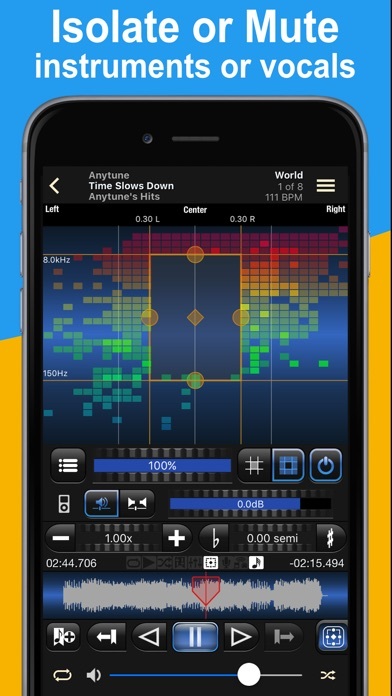 I'm a musician and music teacher and use this app every day for one reason or another and it's phenomenal. However I am hoping for the day files support in iOS is added so I can also extract the files I've copied over to other apps or at least add iTunes file sharing. Add this and I'll make the mythical six star review happen. Great work! All musicians should have this. My band tunes down a half step. This handles that while it keeps tempo, or alters speed, bookmarks, loops. Can’t live without this app! Best tool for transcribing period. I’m a 30 year veteran of countless gigs in NYC and all over the world and I swear by this app! Thanks for the great work!!! Very easy to use once you get used to it. Import songs from your library and slow them down, change pitch, loop sections until you get them down. Definitely with the price. This review is a tad premature, but the features are insane. The only caveat is that, as always, power means complexity and less discoverability. I am used to being able to figure apps out without any instructions, but I quickly decided to seek out the documentation, which is excellent so far. The app is somewhat difficult to use on my iPhone 5s because so much is crammed onto the screen. The reframe feature is so cool. I was able to instantly figure out how to remove or isolate the lead vocals. It’s never been so easy to tell what’s going on with the vocal harmonies. To know and learn can be found in the annals of musical recordings. With the help of Anytune Pro+, all that’s needed is those important intangibles: namely, perseverance and a consuming passion to be great. This app is amazing for practicing an instrument or dance! Well done on keeping the pitch the same whilst changing the tempo! Pleas keep updating this app. I will use it forever! 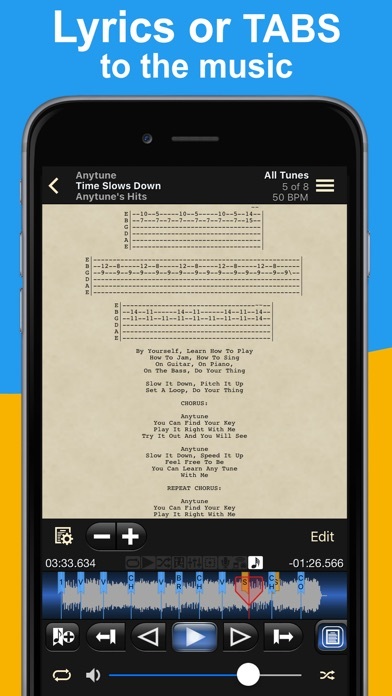 Anytune Pro is the perfect tool for musicians to dissect and learn tunes. As a guitar player, I’ve learned licks that, in the past, we’re impossible to pick apart. My band uses it at rehearsals regularly, to figure out exactly “what they’re doing”. It helps tremendously with timing, breaks, and even harmonies. I will never be without it! I really like the flexibility to change play speed, isolate and loop phrases for practice. 5 stars for me. By far the best most intuitive transcribing tool via app or hardware...EVER! Even at its slowest point of .05 % the app handles like a champ, amazingly clear. The eq presets & feature allow you to tweeze sound & eliminate drum rumble or cymbal harshness. Marker controls & functions are superb & enjoyable to explore recordings. Even as a stand alone listening tool to share solos, excerpts, whatever... with friends. One of the best apps on my phone... eliminates the need to manually import tracks by accessing my phones iTunes then allows conversion to its own file. The portability & ease of use anywhere makes it the default music study app with or without your instrument at hand. Freaking amazing! I paid $300 for a super scope 1/2 speed tape deck in the '80s ... Who knew? Here’s an invaluable tool for any musician needing to learn hooks and bridges and multi-rhythmic passages in a short period of time. Really good for studying jazz and ideas for improvisation. I’m still enjoying it so far! This app is positively INSANE! Prior to downloading it, I’d being trying like crazy to learn a particularly difficult bass solo from the 70s that the bass player improvised on. The groove is SO incredibly funky I just had to learn it. But it was just too difficult to pick up exactly what he was doing. Let me TELL you: I made EXPONENTIALLY more progress in one session with this app than I’d made in months trying to learn it by ear. I have absolutely NO qualms with saying, unequivocally, that this is the best money I’ve ever spent on an app—hands down. Look, if you need some help quickly and, like, NOW—well, here it is!!! As a guitar player, I wish I would have had something like this 20 years ago. I can finally figure out fast licks note for note. Excellent practice app. I use this every practice by myself and band rehearsal. Suggestion, give it a metronome count in and interface it with the Soundbrenner Pulse. It’s hard to GUESS when the tune starts so that makes it hard to practice beginnings, intros.... And with the Pulse added, when the singer doesn’t show the band could still practice with lyrics from the app better in time, sync. I recommend this to all my students! Incredible tool for transcribing music and slowing it down! Best music investment I've made! Only able to add one song from my iTunes library. Tried all of their trouble shooting. Complete waste of money! This app is SUPER helpful when trying to figure out what key to tell my band mates I need to sing a particular song in. Only problem is...I can’t figure out how (or if) I can change the pitch in half steps instead of whole. Can someone help?? This has been the most I’ve spent on an app, & can honestly say that it’s well worth every penny. I was skeptical at first, but after my first interaction I was hooked!!! Great job!!!! Excellent for learning parts of a song! Just a great tool to accelerate the learning process! I'm still so happy... now for years! I own all the competing product. All good, but for my workflow, this is simply the best. I love the visual and the training control over speed and transposition is perfect. I will continue to use this and was very happy to pay... hope it is always updated to fit whatever the current IOS. I also use the version for mac/PC. Thanks to this I play better SAX, sing better, and would have never take up piano/keyboard if I hadn't had this tool! Using it as I end this review. Okay, this is seriously the best app I have ever used. For anything. I can’t stress this enough. If I could give this more stars I would. Just when I think, “this is great, too bad it doesn’t—“ I discover that, in fact, it does. My practice process has been streamlined to the point where tunes that took me an hour or two to learn I am nailing in a matter of 15 to 20 minutes. I am a bass player, and a big challenge has been to hear what’s really going on in covers I need to learn. All has been revealed with the EQ, reframe, pitch shift, and tempo change ability. I have been getting away with it, but I have been playing things “wrong” for years! Sometimes this note-for-note accuracy isn’t critical, but this is ideal for when it is. 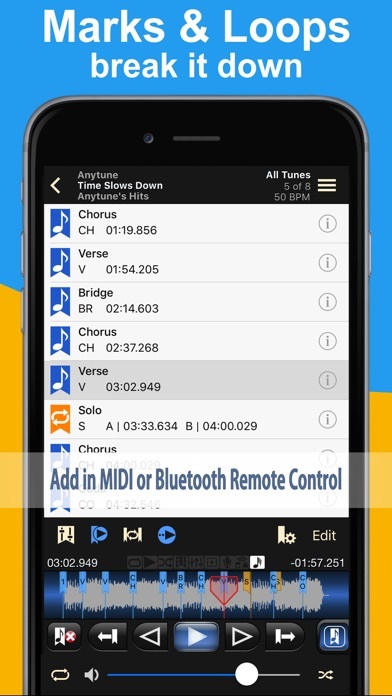 And transcription mode, and audio marks with labels and settings for each, and loops with trainer mode — I could go on about the rest of the features, but let’s just say if you need to practice to recorded music, this is the flagship app for it. I just wish I’d found it sooner, and that it was around thirty years ago! Great app! Please add the 10 or 15 last position marks used in a song at front of the mark list, I have named the Chords like Ab, A, A#, Bb,B, C, C# etc. And 1, 1#, 1b, etc. It’s hard to scroll all the list every time I’m adding chord names to markers, also there are songs that are not on any song list can you add something to let us know songs that are not in any song list, thanks, keep up with your great job your doing with this app, I have the Mac version to, great! The phrase goes best thing since sliced bread. The app is fabulous and perhaps the best app if it’s kind. Updated regularly. My only misgiving is that some of my purchased music comes up protected and an advertisement to purchase an unprotected comes up. A must have for every musician and singer who wants to perfect their practice time. Free version. Slowdown feature is most useful. No idea how to use it: no instructions. Have’t used it yet as no clue. Didn’t realize laptop version different from iPhone OS. Use this app everyday! Thank you Thank you!!!! Such a great app and simple to use. It makes you phone a portable practice studio. I love it! Works GREAT is a life saver! I've been looking for something to help slow down, loop, and isolate guitar parts in songs for a while. This app does everything and it was pretty easy to start using right away. I wish I had found this years ago. Searching always seemed to bring up tons of music players but I sort of stumbled onto this one. Tried the free then bought the Pro version. Great music tool that helps with matching the right keys or slowing down to get each note correctly. Highly recommend. 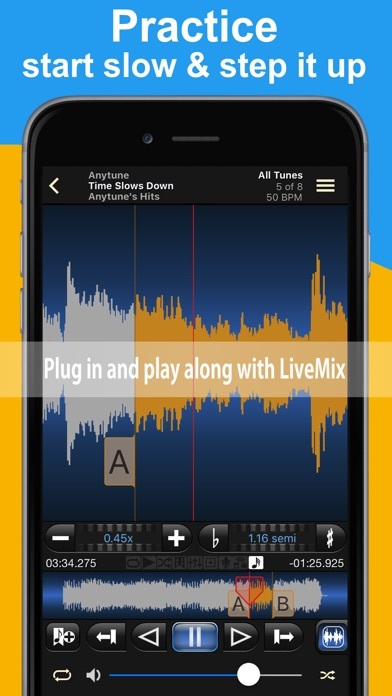 This is the best for slowing down and looping sections of songs. I bought the full version after playing with the free one for only a few minutes. I am blown away by the sound quality and feature set of this app. It is an amazing one stop workstation for anyone learning, playing or performing. If you are hesitating on paying full price, do not be afraid. It’s worth every penny. I’ve been played for 40+ years. Trust me, there are always guitar licks waiting around for someone to explore and exploit. This app makes those seemingly impossible runs accessible and learnable. Just do it. Only (minor) gripe, I find the gui a bit dated. The perfect app for practice. Everything is so easy to use and works perfectly. Absolute must have whether I’m practicing guitar or drums. Fantastic, fantastic tool for practicing guitar, bass, vocals, whatever! Think about how much time you practice. Then multiply how effective that practicing is by 10. Slow down sections but maintain pitch; change pitch to match playing in different key; loop sections to nail them; filter in/out vocals; and on and on. Might be the best musical investment I’ve ever made. Buy it now! Very helpful & easy enough to navigate. Does what it says it will do & does it very well. I’ve been using the app for some time and was very satisfied with it. However, since the update, I’m not able to edit lyrics for any of the music files I have. Please fix it then I’ll update my review. We just finished transcribing “Omohide” by Suzuki Tsunekichi, the theme song in Season 1 of Midnight Diner: Tokyo Stories. We wanted the sheet music. There was none. We created our own. A few years earlier, we contacted Moro for sheet music of his “The Singing Radiance”. There was none. We used an earlier version of this app to create our own. This is an invaluable tool for reverse-engineering a song, BUT, I’m so tone deaf, I must use this along with Transcribe! (the one with an explanation mark in it’s name) for its piano roll spectrum analyzer (runs on LINUX or a PC). A piano roll spectrum analyzer and AnyTune Pro+: my complete transcribing kit. I can’t tell you how many LP’s suffered being replayed almost incessantly whilst I tried to learn a song. This is a great tool and it’s entertaining, too.